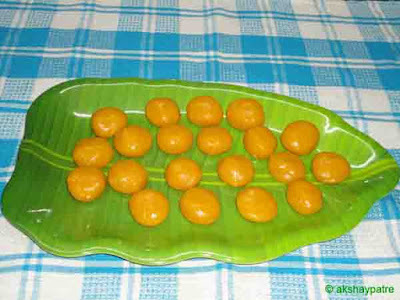 Mango mawa peda recipe - Mango mawa peda is a delicious, melt in mouth and easy to prepare sweet which is available in all sweet (mithai) shops in India. It is made with only three ingredients. 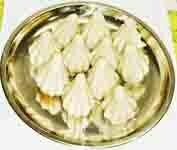 Mawa is also known as khawa or khoya and it is used in almost all varieties of peda and halwa. 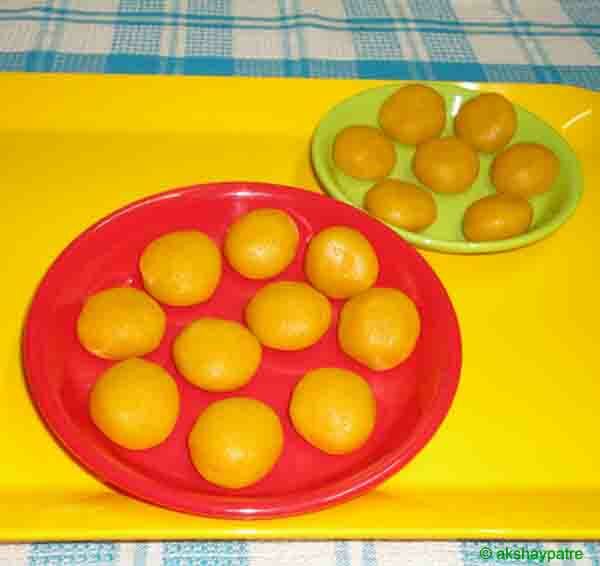 Peda is one such sweet which is distributed and relished during Diwali festival and other special occasions. In all varieties of peda, mawa remains the main ingredient and for variations, mango pulp, saffron, cashew nut or almond is added to get the desired flavor and taste. I know this is an off season for mangoes, so getting fresh mango pulp is a bit difficult. I have used peeled frozen alphonso mango pieces which I had stored in my refrigerator during the mango season. I Made the pulp by using mixer and the flavor was as fresh as taaza mango. If you are making this mango mawa peda during off mango season, you can also use canned mango pulp. When you are using it, reduce the quantity of sugar as the canned pulp already contains lots of sugar. The texture of peda depends upon how much thick the mixture you make. If you would like to have bit harder peda than this soft peda, you can thicken the mixture more than I have thickened. Grate the khawa in a large plate and set aside. Put the mango pulp in a nonstick pan. Place this pan on a low flame. Add the sugar and bring it to boil on low flame stirring continuously. Now the mango sugar mixture slightly loosens. Stir continuously for another 1 minute and then add the grated khawa. Stir continuously till the khawa and mango mixture combine well. Then cook the mixture on medium flame till the mixture become slightly thick and ghee oozes out from all sides. Once the mixture starts thickening, reduce the flame to low and stir till the mixture turns into a lump. Once the mixture become a lump, remove from the flame and set aside till it is warm. When the mixture is warm, make small peda from it and allow it to cool. Store in an airtight container. 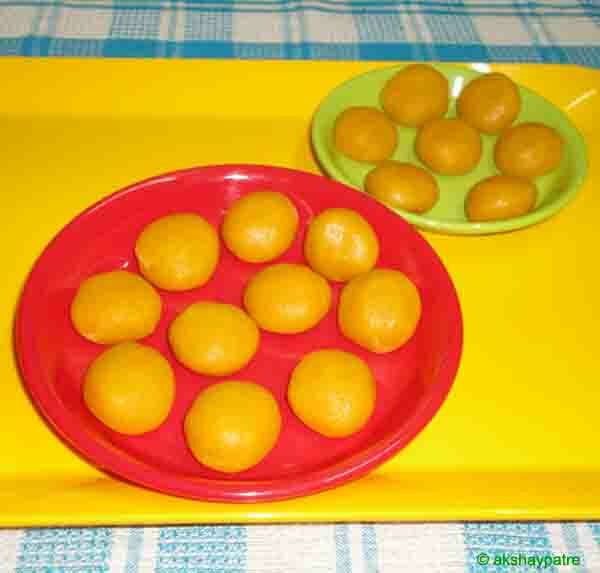 You can store this mango mawa peda at room temperature for about 10 days. 1. Grate the khawa in a large plate and set aside. Put the mango pulp in a nonstick pan. Place this pan on a low flame. 2. Add the sugar and bring it to boil on low flame stirring continuously. Now the mango sugar mixture slightly loosens. 3. Stir continuously for another 1 minute and then add the grated khawa. 4. Stir continuously till the khawa and mango mixture combine well. Then cook the mixture on medium flame till the mixture become slightly thick and ghee oozes out from all sides. 5. Once the mixture starts thickening, reduce the flame to low and stir till the mixture turns into a lump. Once the mixture become a lump, remove from the flame and set aside till it is warm. 6. When the mixture is warm, make small peda from it and allow it to cool. 7. Store in an airtight container. You can store this mango mawa peda at room temperature for about 10 days.